We lived in Seoul, South Korea for two years and during that time, we learned to enjoy many of the Korean foods. Pulgogi (Bulgogi), or Korean Barbeque, is one of best-known Korean dishes. As we traveled around to different sites, it was common to see Koreans cooking pulgogi on a small grill on the sidewalk during the summer. Korean food is always served with rice and kimchi, which is a spicy fermented cabbage. 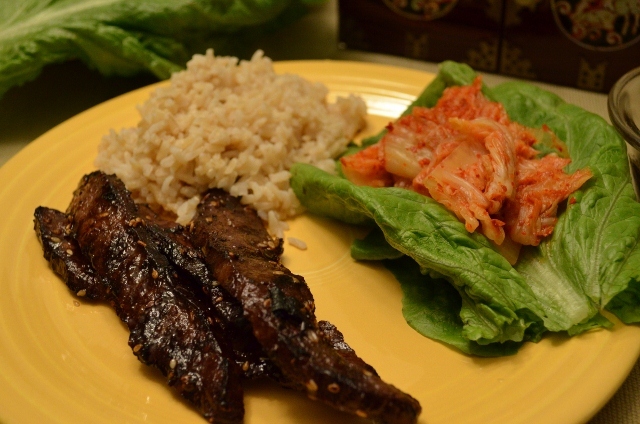 Traditionally, the beef strips are placed on a lettuce leaf along with some rice and kimchi and rolled up to eat. 1. In a large bowl, combine soy sauce, sesame oil, sugar, black pepper, garlic, green onions, and sesame seeds. Add meat and mix well. cover and refrigerate one to two hours. 2. Remove meat from marinade and grill for 2 to 3 minutes per side or until brown. 3. Serve with rice and kimchi or place meat on lettuce leaves with 2 teaspoons hot rice and a dash of cayenne pepper per leaf and roll up leaf. Enjoy! Kalbi is my favorite Korean BBQ (not sure if I got the name right). Oh, I’ve bought pre-marinated bulgogi at Trader Joe’s. I’ll have to try your real version! Oh, yumm! Have to try this one.